Millions of people around the world treasure the time they spend with their Father...their Father in Heaven! 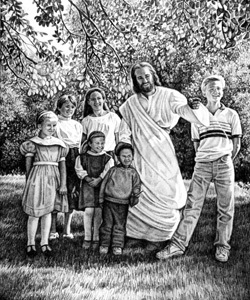 As well as an all-loving Father in Heaven, each of us has a special friend, some say like an especially kind and loving older brother. That special friend is Jesus Christ, the only begotten Son of our Father in Heaven... your life connected to God. Go to the free book "Who is God?" But billions and millions more have not had the luxury of learning about our Father and His Son, some give much sincere and loving worship to false gods, and some find themselves lavishing admiration and worship on things of the world. And millions and millions more have been falsely taught that God is vengeful, hateful, ready and willing to punish His children on earth for the slightest mistake. Where does that leave the human race? A huge scattering of people worshipping false gods; another huge scattering believing in nothing at all but today and tomorrow until we die, and another large cluster backing off from anything that reminds them of the false teachings of fear, hate and punishment.